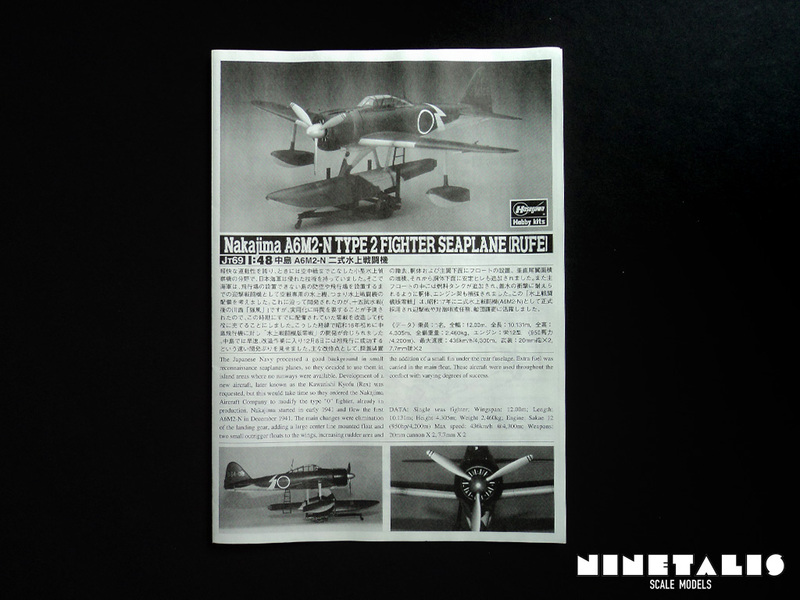 The Nakajima A6M2-N Rufe is the floatplane version of the legendary Zero fighter, which was designed and build by Mitsubishi, but also Nakajima. As the Japanese Air Force prepared itself for the Pacific campaign, it considered the usefulness of aircraft equipped with floats. The reason was very simple, these aircraft would not need any airfield to operate from and could easily take off from the surrounding oceans or inside the many atolls spread out over the pacific. As Nakajima was already working on the N1K1 Ryofu, it was still far from completed by the time the war was about to break out in the Pacific. 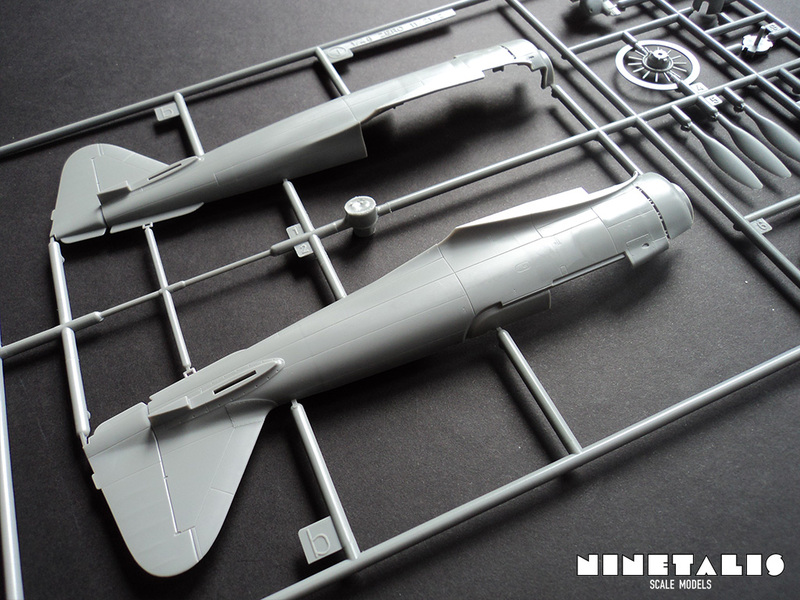 As a stop-gap measure, Nakajima was approached to construct these floatplanes that were based on the A6M Zero airframe. Eventually the aircraft saw combat in all the mayor Japanese theaters, operating in both the northern and southern area of the Pacific Ocean, and even South-East Asia. It enjoyed limited succes scoring many air kills in some instances, as well as being shot down in large numbers at other times. This is because due to the addition of the floats, its performance dropped by 20%. By the time production seized, a total of 327 machines were build. partially based on information found at wikipedia, 10th may 2015. 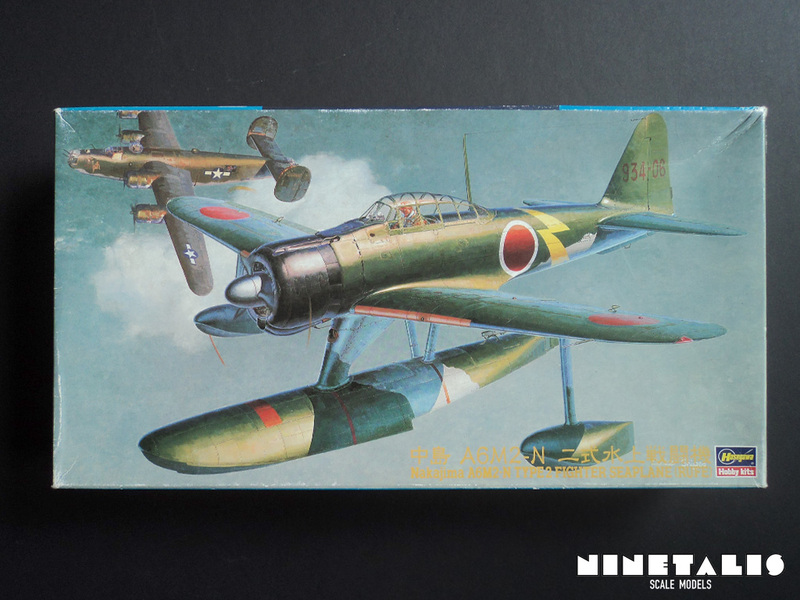 The boxing of this kit features a beautiful box art, made by Koike Shigeo, depicting a A6M2-N flying above an olive drab B-24 bomber flying over an open ocean. I must admit that this has to be one of my favorite box arts which I can find within my stash. A little fun fact to note here is that there is a reason why the B-24 is not damaged. Shigeo once explained during an interview that he did paint some crashing aircraft in the background a few times when he was younger, but no longer wants to depict these aircraft in such a horrible setting, which would be glorifying the idea that young men had to kill each other over different ideals. Upon opening the box we are greeted with many materials which fill the box to the brim. They are neatly packed in two separate bags, as well as a separate leaflet with the instructions and markings. 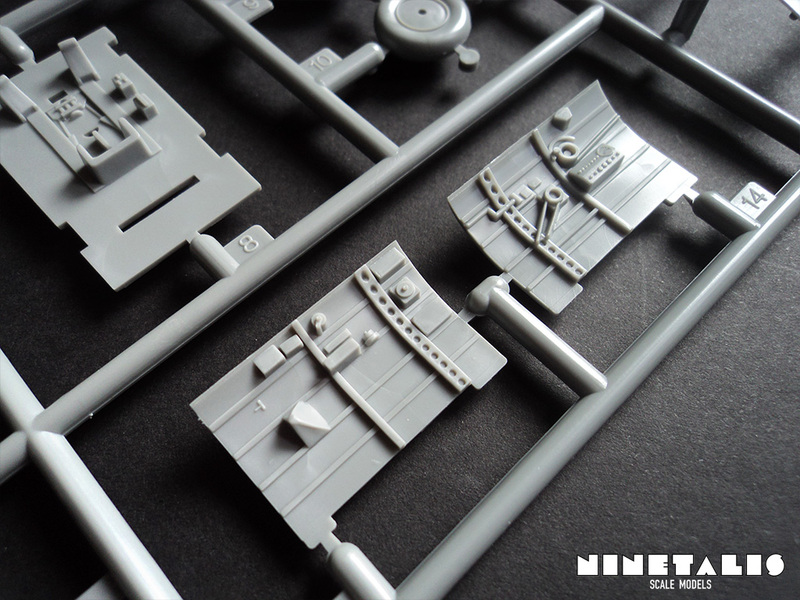 In total we have eight sprues, all featuring fine details as recessed panel lines and raised details. 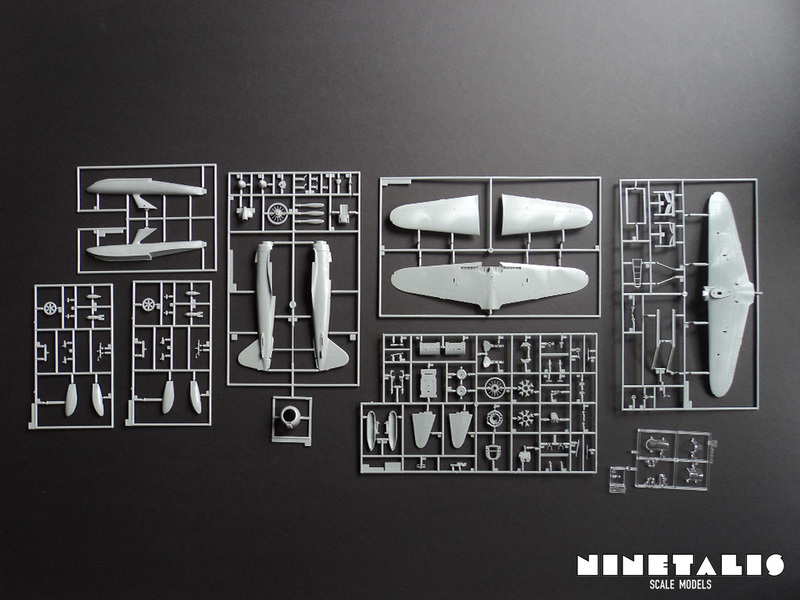 Some good news for the spare box collectors is that this kit features many parts, of which a good part aren’t needed when building the Rufe floatplane. 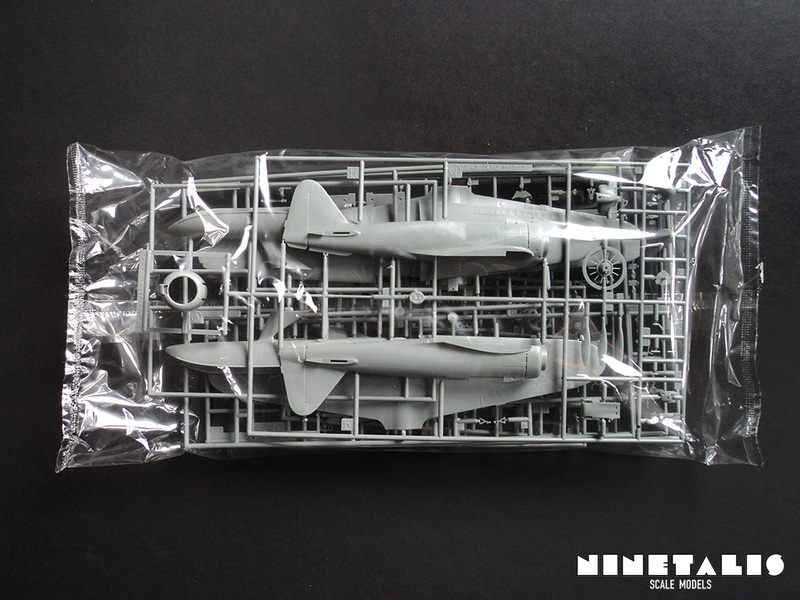 This is because three of the frames are standard with every Hasegawa zero kit. 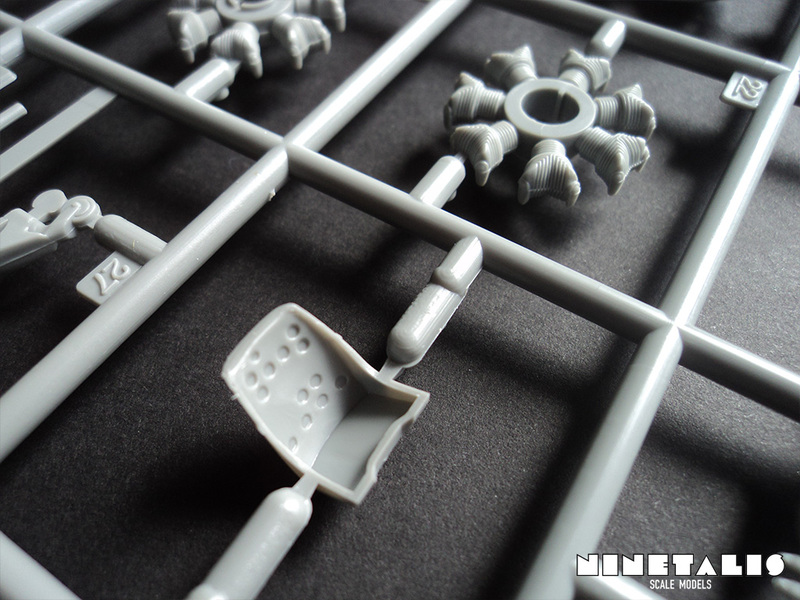 The first sprue is made up from two sprues. 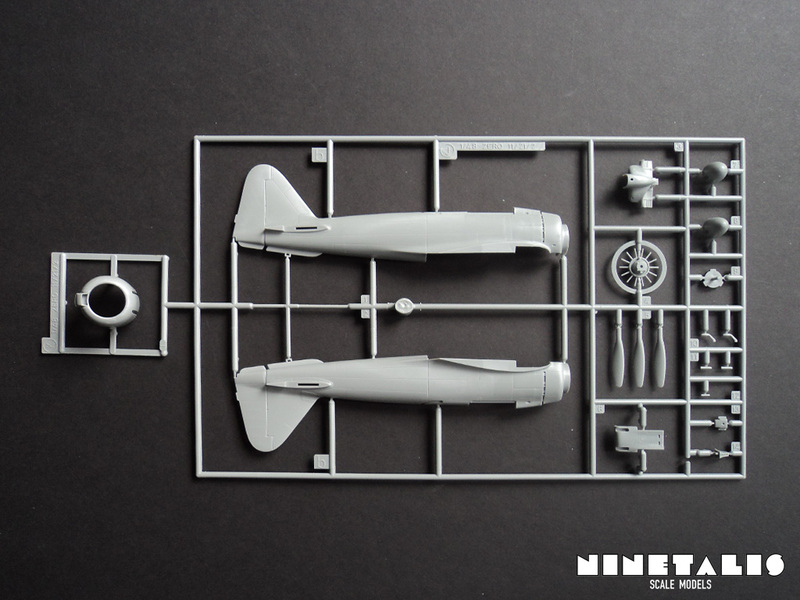 Sprue J holds both fuselage halves, the propellor cone and blades, as well as some other parts needed to complete the fuselage. 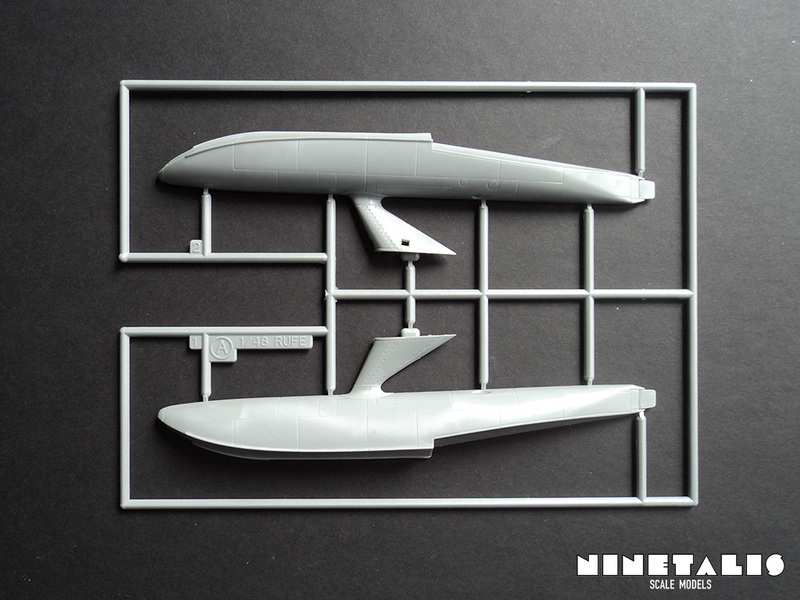 Sprue K only features the engine cowling. 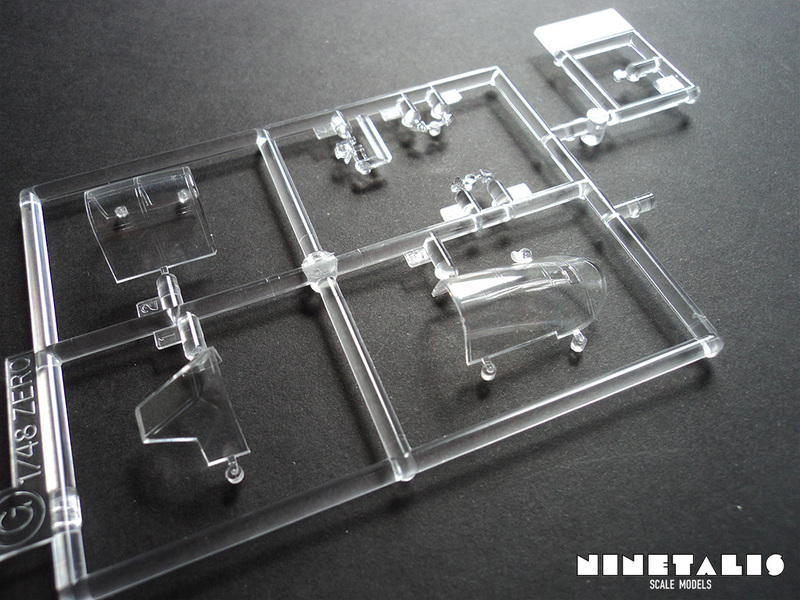 The parts on both sprues feature recessed panel lines and raised details. One thing to note is that on the left fuselage half, there is an attachment point connected with a little step near the tail. Be very careful that you don’t damage or remove this part (on purpose or not) when cutting the part from the frame! 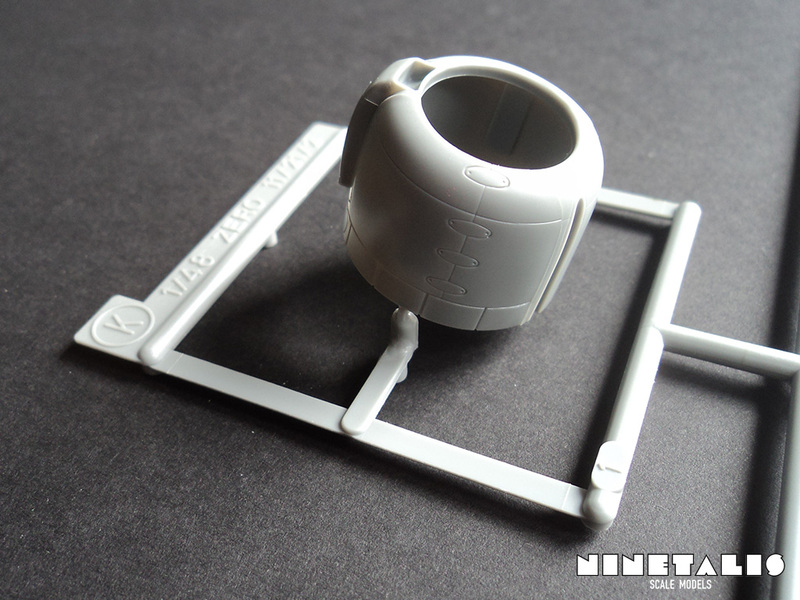 This sprue holds three parts. The upper and lower parts of the wings. 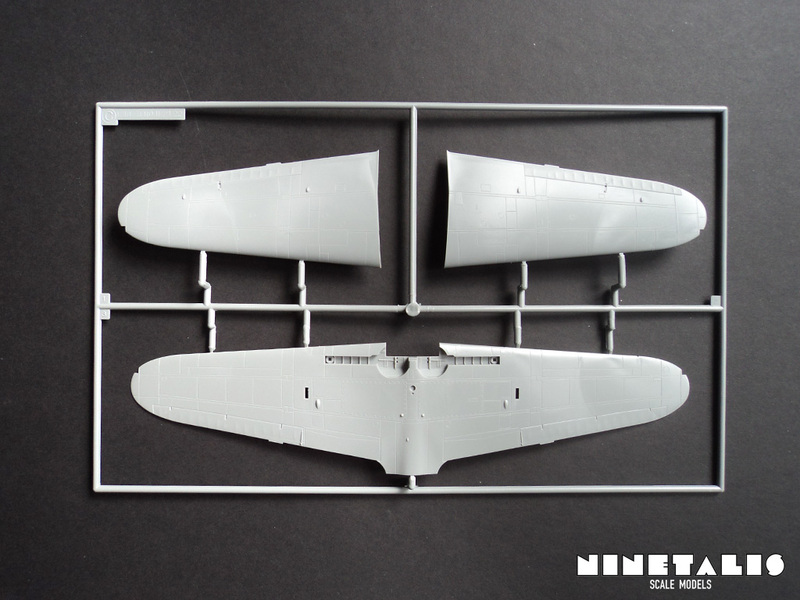 However, because this kit is supposed to be build up into a Rufe floatplane version, we won’t need the lower part which is obviously designed for a normal Zero. 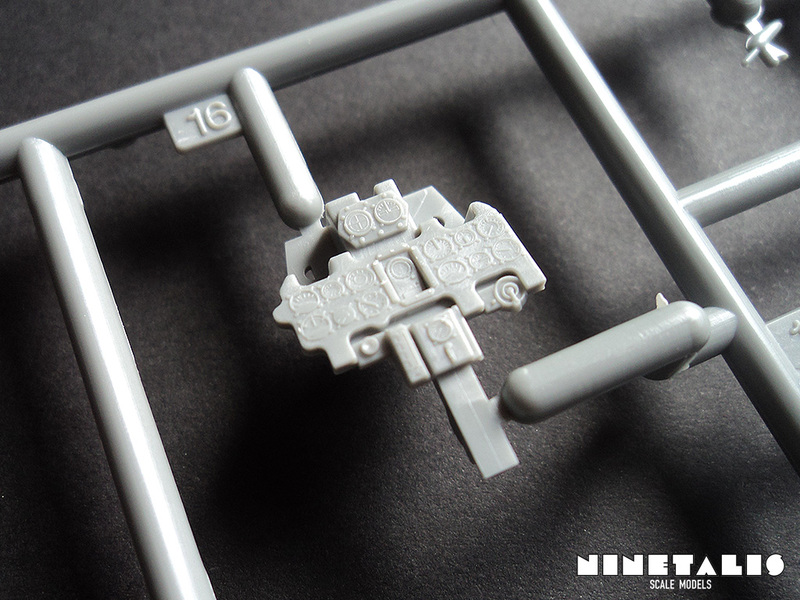 The E sprue holds many of the small detailed parts that are common with all the Zeroes. 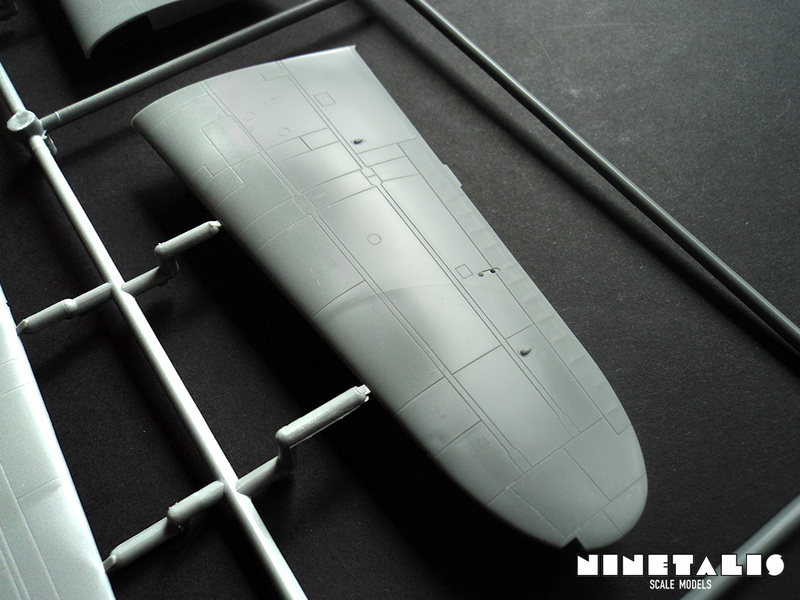 As a result we have many spare parts like the landing gear, wheels, wheel bay covers, a drop tank and more. Parts that are needed are of course the cockpit, pilot seat, instrument panel, engine and the horizontal stabilisers. These all feature beautiful details like recessed panel lines and raised details. 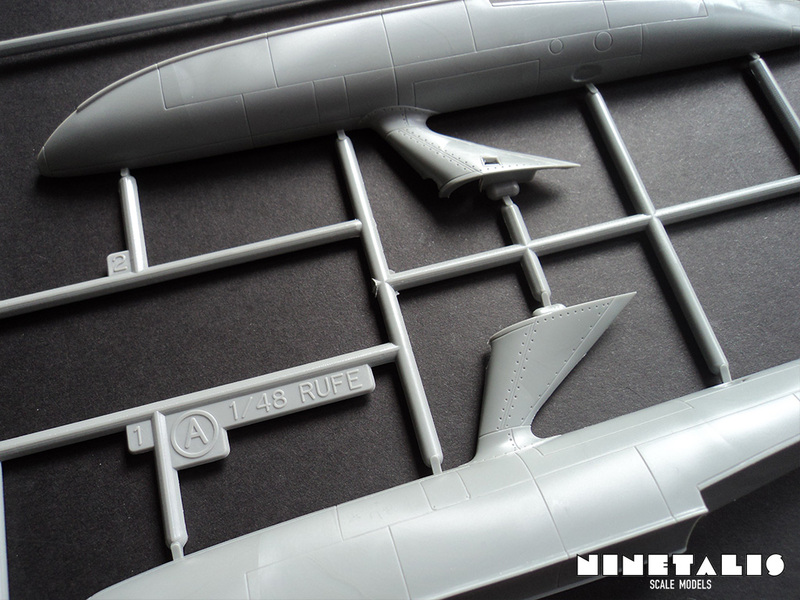 Sprue A is made up from only two parts, which are the left and right side of the center float. As can be seen from the close-up shot, the part features extensive details like rivets and recessed panel lines. 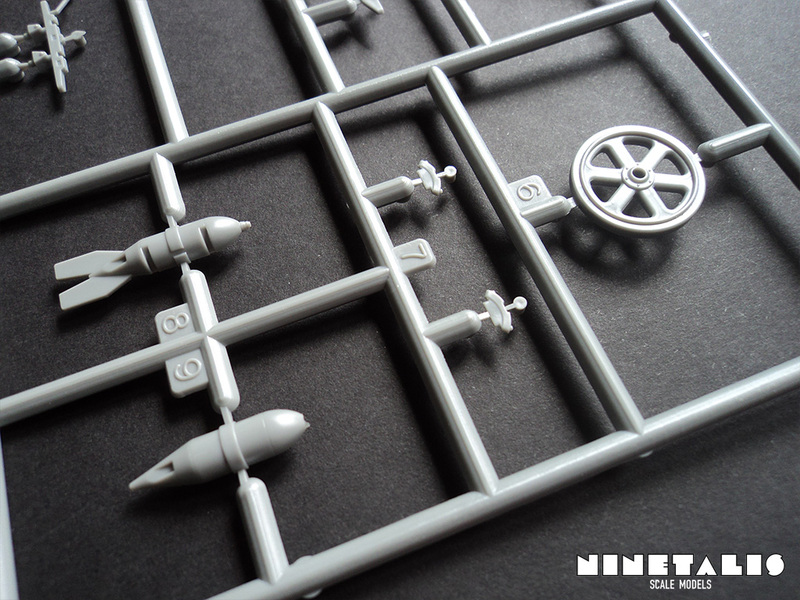 The last two styrene frames are small parts like the outer floats, 50kg bombs and the hard points, as well as wheels for the carriage on which we can place our Rufe once finished. 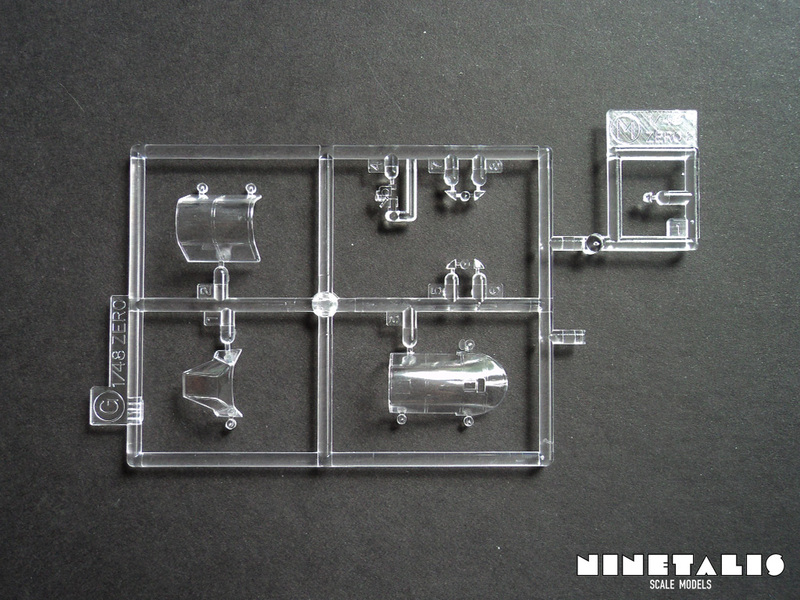 The Clear sprue is build up from 2 small sprues. Sprue G holds the canopy parts and navigation lights, while sprue M holds a navigation light that is to be used specifically with our floatplane. 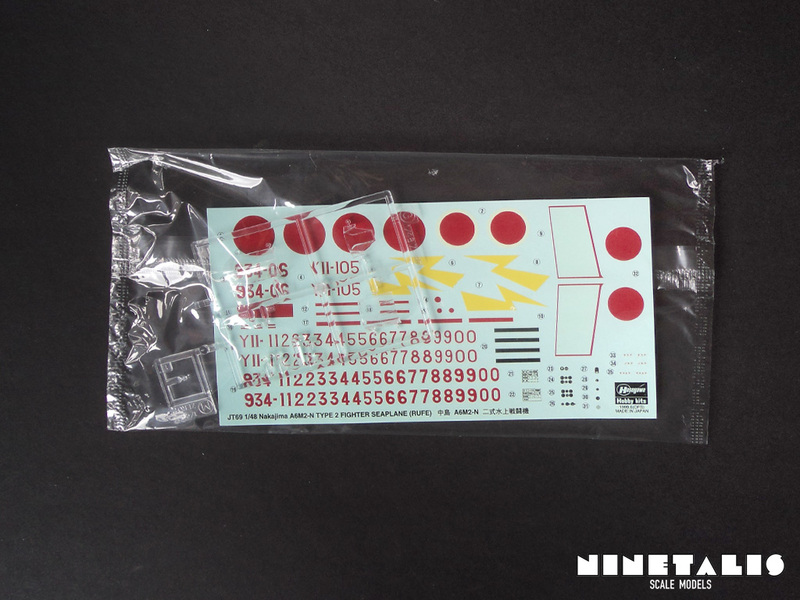 The sprue was packaged together with the decals (as can be seen on the picture below) and have thus been kept free of any damage over the decades since it was produced. 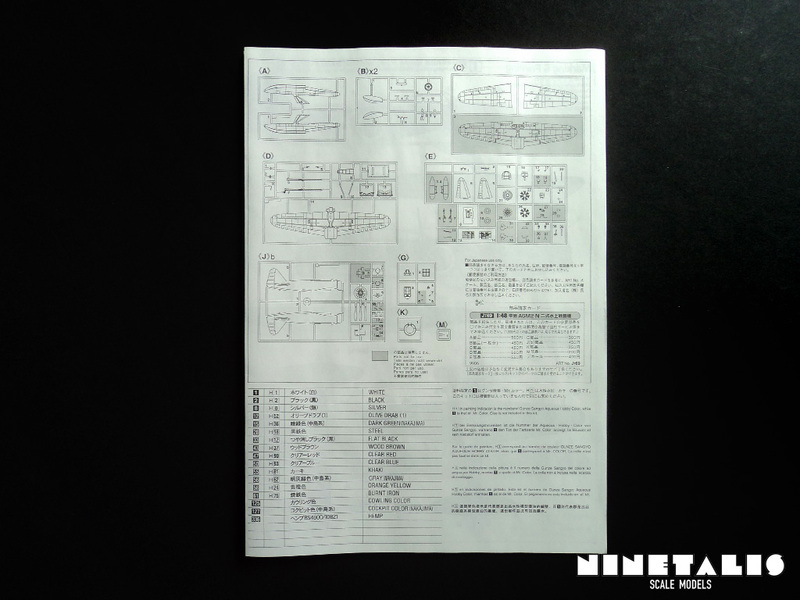 The decal sheet is very extensive and is typical for the older Zero boxings from Hasegawa. 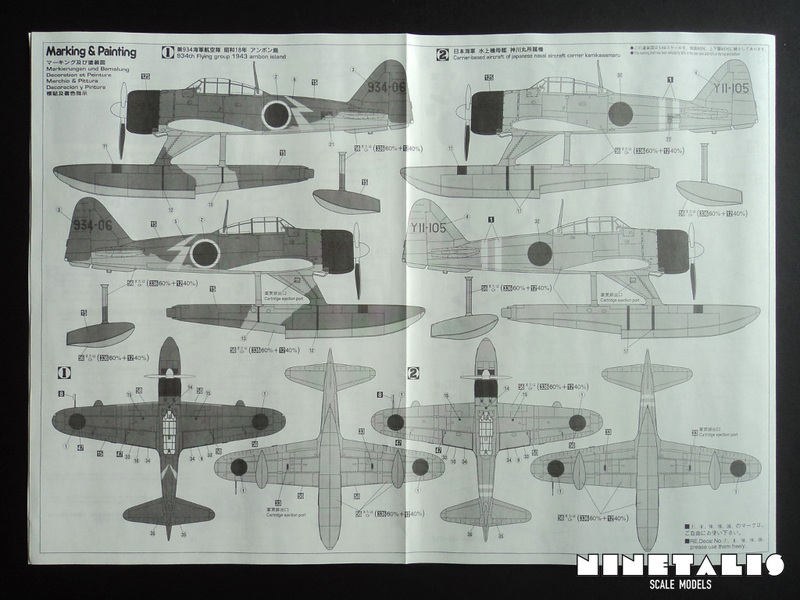 Not only can we find Japanese insignias, identification banner and identification codes of the markings that are provided within this kit, but also four of each individual identification number in two different types of character sets. 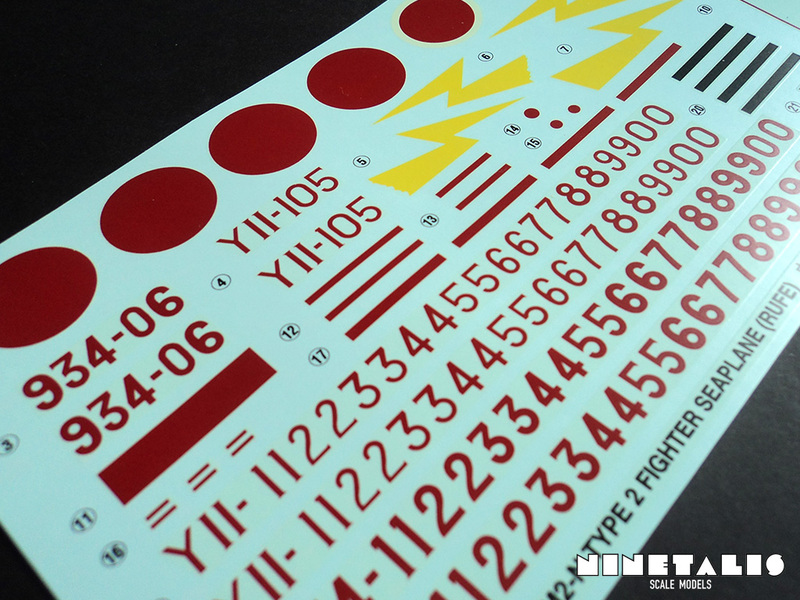 This is really nice for those who would like to build a certain aircraft without the need for buying a separate decal sheet of identification numbers. 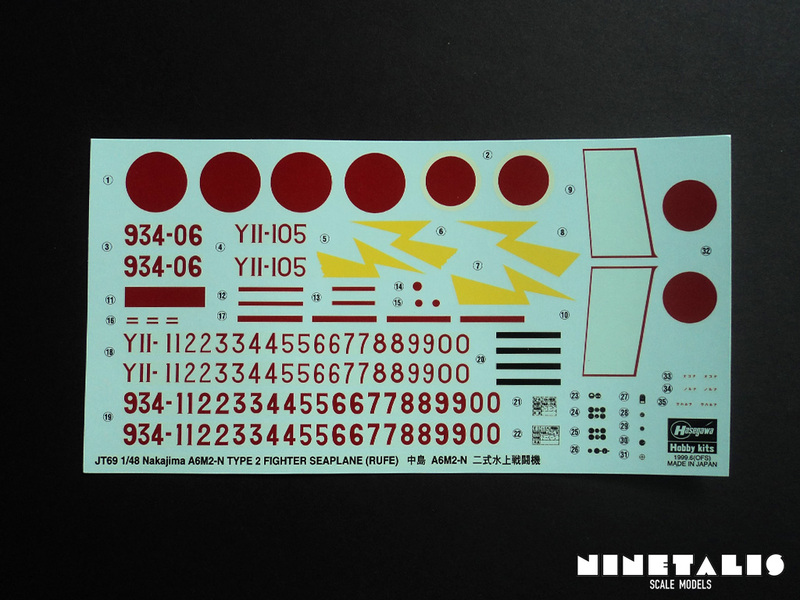 However, because of the age of this decal sheet, the decals have started to yellow. Not only has the white around the Japanese insignias started to yellow, but also the overflow of the other decals, which is visible on the detail picture of the decals above. Maybe this goes away after applying the decals onto you model, but I really doubt it. You can overcome this problem by painting the Insignia, and cutting away the overflow of the identification codes as much as possible. The instructions leaflet is a long sheet which folds into a leaflet the size of an A4 sheet of paper. 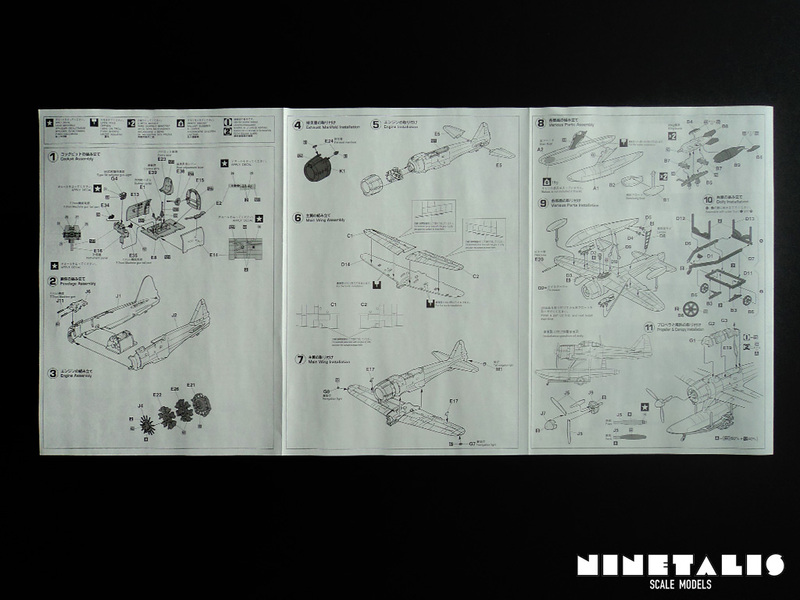 The instructions are visualised with digitally created illustrations like we are used from Hasegawa, and are divided into eleven individual steps. The colours that are needed are shown with Gunze Sangyo colour codes. The builder has a choice of 2 types of paint schemes. 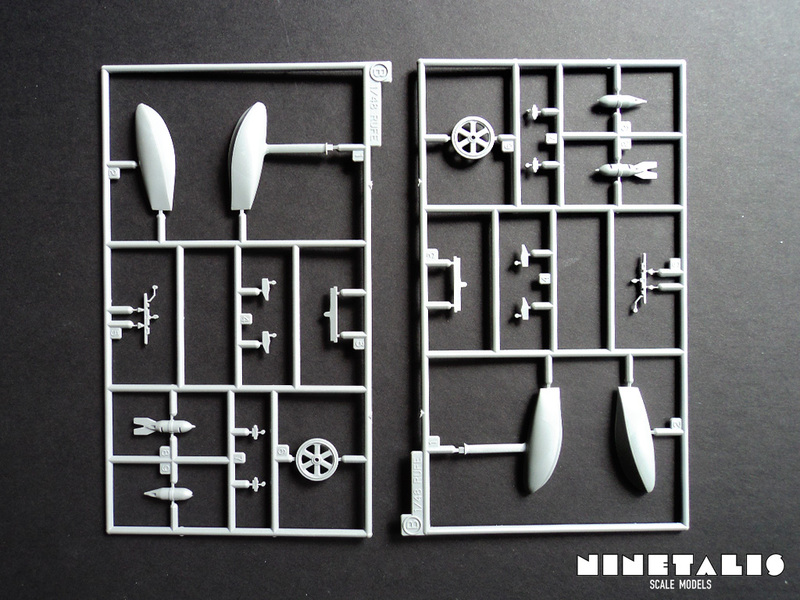 The first is the classic IJN Green upper surfaces with IJN gray on the lower surfaces. The second is the iconic broken white which we can find on many A6M Zeroes. The color charts are identified with Gunze Sangyo colour codes. What a kit this is! 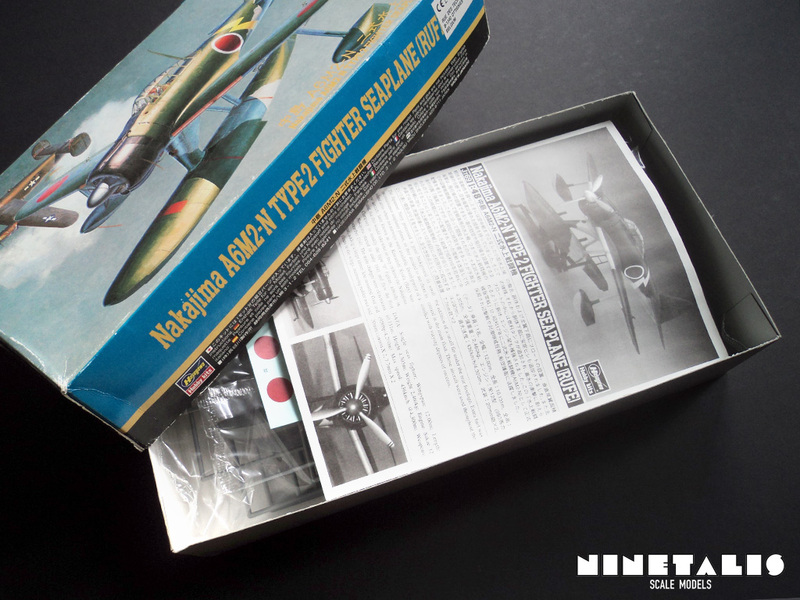 Considering this was the first release of Hasegawa’s Nakajima A6M2-N Rufe I must say that I am rather impressed with the amount of detail which can already be found inside this kit. Constructing it should really pose no problem as well. 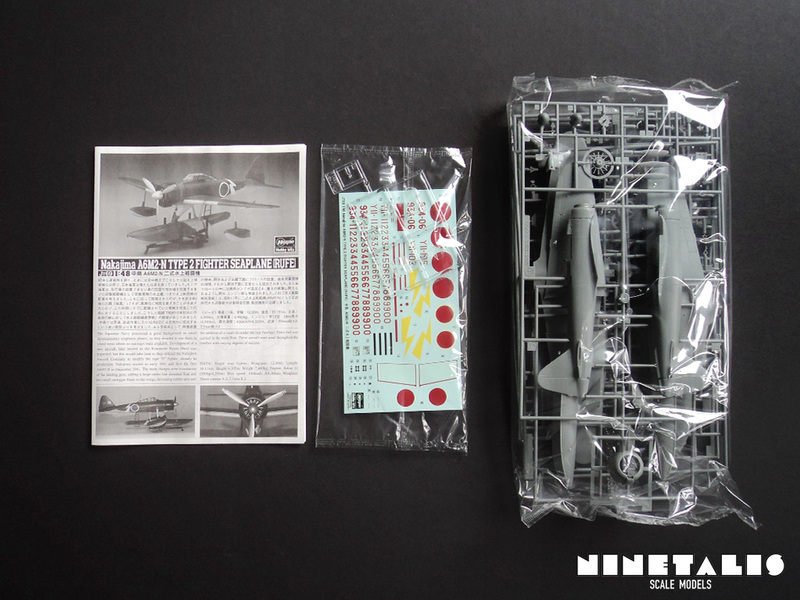 Having build a A6M2 Zero kit from Hasegawa before, I do not recall any problems at all concerning the identical parts you will need to build this version. 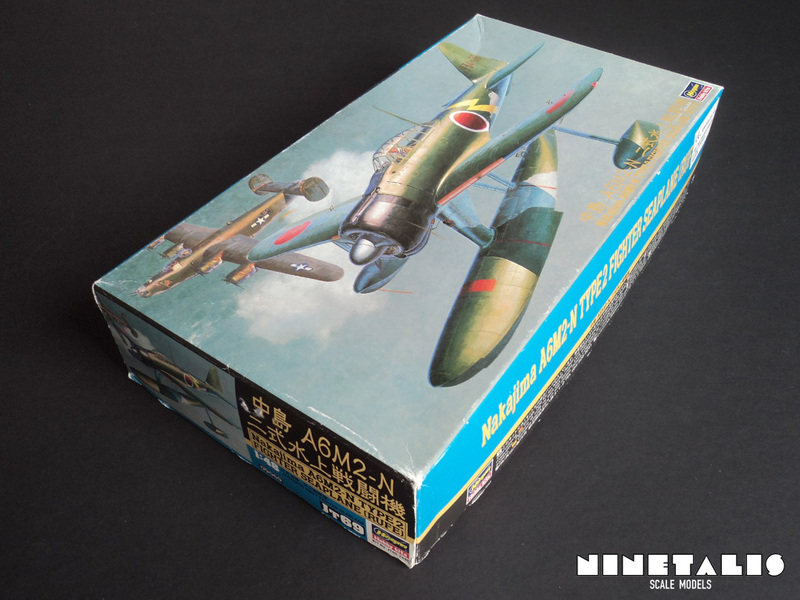 The only downside of this kit is maybe the price and the decals and by that I don’t mean what Hasegawa has provided us with, but more how they have yellowed over time. This is of course a problem that is common with decal sheets and to be honest I have no idea if this actually can be helped at all. Definitely recommended for all levels.